So, here it is, promising a new chapter of Long John with its release, the cover to Chapter 3: Making Smoke. The most immediate and noticeable difference is this cover’s step away from the graphic, simple, design-focused images of the previous two books. 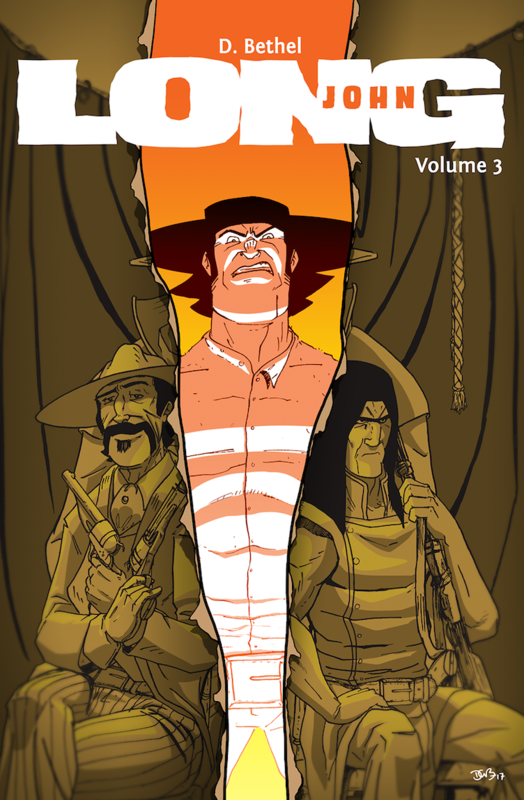 The main reason is that inspiration struck me unlike, I think, any cover I’ve done in the past. Though I do make visual art, I am a little boring because I don’t often dabble in the realm of either interpretive art nor graphic design. At my core, I’m a storyteller with the stuff I draw and what I like to draw is the stuff that shows what’s happening. Sometimes I get a little wild, but not often enough to really say that I like bringing in abstract ideas into my visual storytelling, which is at the heart of most covers (well, of the covers I like, at least). All D. Bethel-designed covers so far. It’s clear it took some time to figure out proper sizing. Click to enlarge. But this idea came out of nowhere one day (I think while I was watching my students do peer workshops, actually), and I quickly doodled down the idea of a daguerreotype (more specifically, a carte de visite, a popular early paper photograph) of The John posse but with the middle torn out so the “before” Long John remains unseen and, in his place, is the current Long John of the comic. It works thematically for the chapter and provided an interesting visual element. The daguerreotype portion was inspired by images that popped up during my research of the period, where a surprising number of outlaws––as a means to thumb their noses at the law and “civilized” society––would openly flaunt their status and go get professional portraits taken. 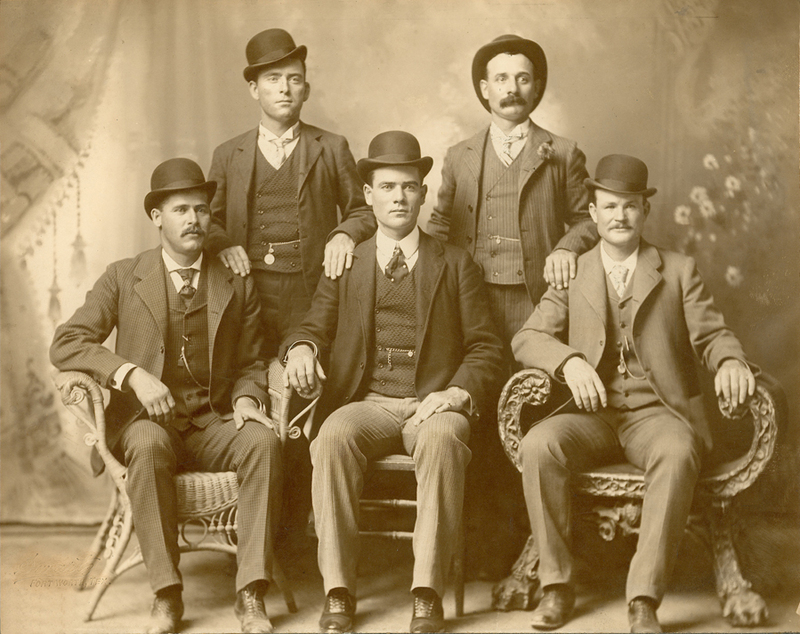 The most famous of these is the portrait of Butch Cassidy with his Wild Bunch, which he would (and this may be apocryphal) send to law enforcement once he escaped their chase. Butch Cassidy and his Wild Bunch gang sitting for a portrait, inspiring Chapter 3’s cover in the process. Source: Wikipedia. Overall, I’m pretty proud of the final cover. The hardest part was getting the colors right, but when those fell into place, the rest was easy. Unlike the comic––where I make sure that the entirety of the art is on the physical page––I’ve always been digital-forward with the covers. While all the elements on this cover are hand-drawn, they were drawn as two separate pieces. First, I drew out the flashback portrait of The Johns in its entirety, including Long John in his original clothes (which he has yet to be seen wearing in the comic and never will be). On a different, loose sheet of paper was the angry “modern” Long John. I created the tear in Photoshop and pieced the two together. 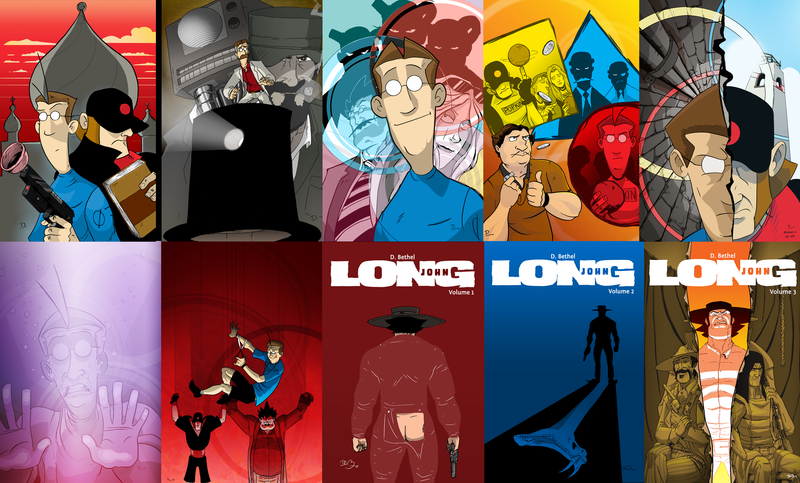 It was probably a longer, more frustrating process than drawing the entirety on a single piece of paper, but something about drawing the original Long John––the “before” Long John––felt important to me. It was almost as if I felt like that Long John deserved a cover, too, if in the end he still remains unseen. 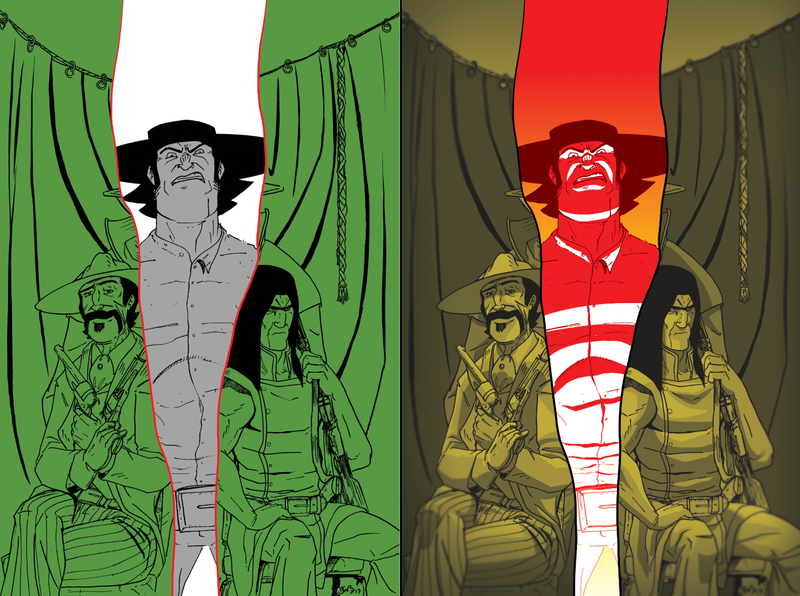 Mock up comp (left), first pass at colors (right). Now, all that needs to be done is finish up Chapter 3. As the video at the top says, I’m aiming for its debut Free Comic Book Day in May, but––who knows––something could always pop up and delay the process, though I don’t see what would do that.